“Antithi” (“The Guest”) is the fourth episode of the anthology television series Stories by Rabindranath Tagore (2015) that was created and directed by Anurag Basu. The episode is based on the short story of the same name that Tagore (1861-1941) published in 1895. It tells the story of a gentle teenage boy consumed with wanderlust. “I simply want to live life. I don’t want to ask the tall trees how they grew so big. I simply want to watch their vastness and feel delighted. I don’t want to question the flow of the river. I simply want to watch it flowing, for miles on end. I want to assimilate this unique aspect of nature within myself. I want to lose myself and not find myself. I want to dissolve, as the sun dissolves in water. It is on this account that Tarapada, perpetually searching for new experiences with life’s wonders, has many times run away from his home and family. 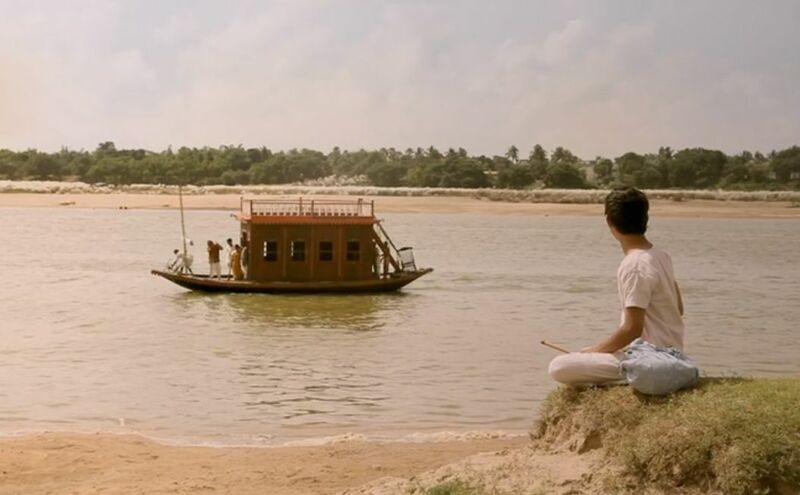 So the boy now wanders off on his own and encounters a zamindar, named Motilal, and his family traveling on the river in a budgerow (houseboat). When the boat docks, the helpful boy makes himself useful to the zamindar’s retinue, and soon he is taken on as an extra helper. Although Tarapada is at first only a servant, his constantly cheerfully congenial and assistive nature soon endears the boy to the zamindar’s family. When he is not industriously attending his chores, he charms the family with his singing and flute-playing. In fact Tarapada’s many soulful vocal serenades charm this viewer, too, and are a feature of this episode. After awhile the zamindar and his wife invite Tarapada to come to their stately mansion, and they begin treating the boy like a member of their own family. But not everyone is pleased with this new situation. The zamindar’s preteen daughter, Charusashi (aka Charu), is spoiled and not used to sharing the spotlight of the family’s attention with someone else. Soon she is petulantly disrupting or spoiling as many of Tarapada’s activities as possible. When the good-natured boy refuses to take offense at her shenanigans and tries to befriend her, she simply sulks and turns away. Things only get worse for Charu’s spoiled ego when she learns that her father has begun teaching the inquisitive boy English. Charu demands to be included in the English instruction, but she doesn’t have the discipline to learn; she only wants to be the center of attention. When that fails, she insolently spoils Tarapada’s homework by pouring ink all over it. All during this time, though, Tarapada remains patient and forgiving. And little by little, Charu slowly warms to Tarapada’s presence, and they start spending more time together. At this time Motilal and his wife are thinking of choosing a marriage partner for Charu. Although the girl is very young, the arranged marriage of preteen girls was common in India at this time (Rabindrath Tagore’s own wife was only ten-years-old when she was married to him). However, when an audience is arranged for a prospective groom’s family, it is spoiled by Charu’s ill-tempered tantrum, and Motilal and his wife realize that it will be difficult to find anyone who can put up with Charu’s petulance. They finally come to the conclusion that Tarapada would make an ideal husband for Charu. Although he comes from a poor family, he is intelligent, cooperative, industrious, and seems to be the only one who could tame Charu’s self-indulgence. Motilal is so impressed with the boy that he also intends to include him as his partner in managing his landlord estate. Tarapada will become more than a guest, he will become like a step-son, and this is a once-in-a-lifetime opportunity for the boy. But can he resist his eternal urge to hearken to and follow the song of the open road? You will find out at the conclusion of this story. Overall, “Atithi” is a tale that is exquisitely told. It displays a poetic lyricism featuring an almost perfect blend of soulful music and atmospheric imagery. In fact for the expression of its narrative theme, it stands as a cinematic “tone poem”.